The Office of the Provost recently proposed a number of revisions to Tech’s academic calendar, including an overhaul of the dead and finals weeks in plans set to be fully implemented by Spring 2016. A task force of various members of faculty and the student body under the leadership of Associate Vice Provost for Undergraduate Education Steven Girardot began working towards a proposal to revamp the final two weeks of the academic calendar last Fall. The proposed model was created as a result of goals of reducing student stress and providing increased time to study during finals week. According to Girardot, many colleges already implement reading periods in the days directly preceding final exams. The proposal would wrap finals around the last weekend of the semester before graduation. Primary reasons provided by the task force for the planned changes were giving students more time to study for finals, breaking up final exam week and preventing conflicts between finals and end-of-semester activities. Friday of what is currently finals week would be completely free of scheduled exams under the proposed alterations, allowing forfull allocation of the day to commencement among other things. Laura Margaret Burbach, SGA’s Vice President of Academic Affairs, represented the student body on the task force. Burbach also stated that assignments could not be due during the final instructional days. 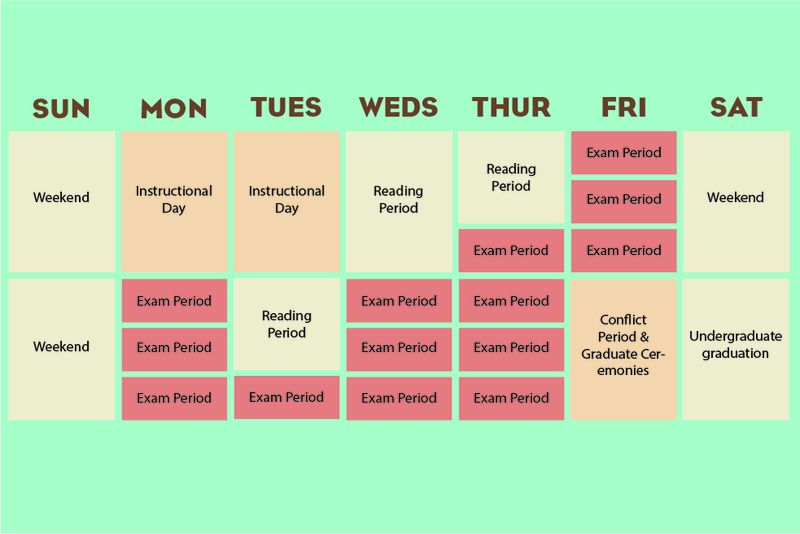 According to the proposal, the first exam period would be placed in the afternoon on Thursday of the former dead week, and conflict periods would be placed throughout the subsequent Thursday. The full proposal also includes provisions to add two class holidays into the academic calendar in an effort by the task force to break up the semester. Last year, the Curriculum & Institute Policies Committee of SGA focused on reducing the total number of days in Tech’s academic calendar. According to Burbach, Tech has a lengthier academic calendar than all other public universities in Georgia and many large research institutions. A comparison between Tech and other peer colleges was conducted. Burbach also added that three instructional days are being removed due to the restructuring of dead week. These changes among others were submitted to Tech administration by SGA in a white paper. The task force also proposed to re-examine Tech’s daily class schedule. “We can actually have the same amount of contact hours…but less actual meeting dates,” said Girardot. The proposal involves an increase in Monday, Wednesday and Friday lecture length from 50 minutes to 55 minutes. The extra minutes would allow almost a week to be cut from the semester, days of which could be allocated to longer breaks, more class holidays or other purposes. Girardot indicated that the details of any changes needed to be fleshed out to a greater extent, and it still needs to be approved in more than principle by the faculty. The Thanksgiving class holiday will be phased in this Fall, and Spring 2016 will be the first semester in which the revamped dead and finals weeks will be implemented.